There are a lot of headaches involved with traditional rowing. Even rowing machines can be a challenge with water and magnetic at-home rowing models being expensive and bulky. For an indoor rowing experience, air rowers are a more affordable, compact way to condition muscles and improve cardio health at home. In this piece, we’ll take you through the best air rowing machines on the scene today. The best-looking design on the market, a solid price point, and a very impressive feature set. The smartest machine out there. Comes with a nice design and a handful of unique connectivity features. The best rower for the money. A solid, comfortable machine with one of the best prices on the market. A great step-up choice with a striking design and an in-depth monitor. Doesn’t break the bank, either. The best hybrid rower out there that offers a combination of air and magnetic resistance for quiet operation. Eight adjustable resistance settings and an advanced monitor make workouts easy to control and customize. ANT+ and Bluetooth connectivity give you access to online workouts. An artistic, sleek design fits in well with many decor styles at home. Good comfort features with padding in both the seat and handles. Comes with a nice color choice that lets you go with a bold or subdued look. The performance monitor is the most fully-featured on the market with unique stats like watts and time/500m. A hybrid design combines the benefits of both air and magnetic resistance. Features an unmatched 16 levels of electronic resistance. An average handle that may not be as comfortable as others. Lacks portability and storage features. A price point that corresponds with its unique features, this model is more expensive than other options. No resistance adjustability, giving this machine low customization potential. A dated design. The monitor suffers from some overcrowding and a lack of readability. It also has less frame support towards the middle of the machine itself. 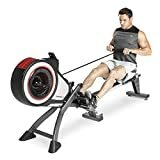 Why Buy an Air Rowing Machine? Aerobics. Consistent rowing works out the heart and lungs, improving your overall cardiovascular health. This can lead to some impressive calorie burn: about 600 calories/hour with typical rowing workouts. Muscular conditioning. The natural motion of rowing works for several different muscle groups throughout your body, from the quadriceps to the abdominals, pecs, and rhomboids. Low impact. Rowing is easy on your joints since there are no forceful movements involved. There’s also no impact with the ground, making it very low risk when compared to something like running. HIIT training potential. Speeding up and slowing down your rowing workout intermittently can create periods of high intensity. This gives you an impressive level of variability without the need for built-in presets. Stamina, out of Springfield, MO, is one of the most dependable air rower brands. They’ve become renowned for their InMotion and ATS Air rowers. Founded in 2002 in Los Angeles, CA, Sunny Health & Fitness has established itself with rowers like the SF-RW5633. Rowers like the Model D have made Concept2, founded in Morrisville, VT, one of the best brands in indoor rowing for more than 40 years. 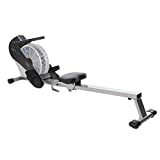 Air rowers offer more midrange prices compared to other indoor rowing machines. Generally, they’re in between hydraulic (less expensive) and water (more expensive) models. $250 and under: Budget and basic models in general. Usually lack features like monitors, trackers, and workout presets. $250-$500: More common models. Most typically come with more durable frames and a few more amenities like trackers when compared to lower-priced options. $500+: Usually good for commercial use, these machines offer maximum durability and better build quality than the rest. They often come with high-end, modernized features as well. Air rowers create resistance you can control using a spinning flywheel. Some models also control resistance using a damper. The flywheel offers more “glide” than other types, creating smoother strokes. Hybrid-resistance models differ, using a combination of air and magnetic resistance. This cuts down on noise and adds a magnetic brake that will kick in at higher speeds. The size and shape of the handles on a machine will affect its overall feel. Handles on an air rower are connected to the flywheel by a cable. When the user pulls back for a rep, the flywheel spins. It’s important to make sure that the length of the rower matches the length of your stroke. It should always be long enough for you to get full extension. A grippy seat will help your stroke stay solid and keep you stable. Some rowers will come with a small display that helps you track your metrics, workout information, and settings. Higher-end models may feature more tracking options, and budget models may offer fewer controls or forego the screen entirely. Generally speaking, bigger displays are more convenient. Some of the best air rowers will include vents that direct the flywheel’s air movement back towards the user. This venting provides natural cooling with each stroke. If you tend to feel overheated during your workouts, this could be a helpful feature. Size: Rowing machines tend to be more space friendly than most exercise equipment, with a footprint similar to a loveseat. Folding frames are common and help to make the machine’s footprint even smaller when not in use. However, it’s still important to make sure your machine can fit comfortably in your workout environment. It should also be long enough to accommodate your height. Comfort: The design of the seat and the handles will affect the overall comfort of the machine. Look for models that offer ample padding to maximize comfort for longer workouts. Textured handles are also helpful to prevent slippage and failed reps. Surrounding environment: Air rowers, while affordable and convenient, can generate a lot of noise due to air movement. This can be distracting in common areas like family and living rooms. Choose an isolated room if possible or look at other rowers options. A striking design, top-of-the-line technology, and an impressive price all make this our top pick overall. Adjustability, a rare feature in air rowers, helps it rise above the rest, while one of the most intuitive computer displays on the market offers plenty of functionality. The Turbine comes with eight adjustable settings for maximum customizability. The display keeps track of your speed, distance, time, calories burned, and strokes/minute for efficient workouts. An ergonomic seat along with adjustable foot straps keep you comfortable. It’s also the slickest looking machine on this list. Potential disadvantages of this machine include a pretty average handle along with a relative lack of portability features. If you want to move around your rower regularly, this is something to note. If you’re looking for a solid machine at an incredible price, this is the pick for you. Comfort is the ATS’ brightest point, featuring solid upholstery on the seat and extra padding on the handle. Its simplistic design also makes it a breeze to use. A large, easy-read LCD monitor helps you stay on top of your workouts. The choice of three colors lets you pick a machine that’s either bold or subdued. Built-in wheels, along with a compact, folding frame, make this a great pick if easy storage and portability are important to you. Downsides of this machine are its lack of resistance adjustability and a somewhat dated-looking design. No adjustability ultimately gives you less control over your workout. If connectivity and data tracking are high priorities for you, then the Model D is a fantastic choice. The performance monitor goes above and beyond, offering not only Bluetooth but ANT+ connectivity as well. This gives you the freedom to connect wirelessly to fitness apps and heart rate monitors for easy tracking. The machine also features a sleek design that stores in two pieces and assembles with only eight screws. These top-of-the-line features do come with a top-of-the-line price. It soars around the $1,000 mark, which is among the highest on the list. However, a smart design and an impressive set of features give you plenty of bang for that buck. This is definitely one of the best mid-range, step-up models on the market with a good set of features that don’t break the bank. This is most apparent with the performance monitor, which packs in a handful of stats and displays everything on one screen. The rower’s capabilities are complemented by a slick, athletic design. Large foot pads along with an upholstered seat make this a comfortable choice. Additionally, the folding, rolling frame makes this another good pick for saving space. The performance monitor is crowded and can be difficult to read mid-workout. The frame also seems to have less support than other models, especially towards the middle of the unit. This may call into question its long-term durability. This machine makes the list for being one of the best hybrid rowers on the market. Combining air and magnetic resistance, the combination makes it a good choice if you’re weighing air vs. magnetic rowing machines. Additionally, if noise is a concern for you, this is a great pick. The hybrid design makes the machine quiet, eliminating most of the fan-like noise created by pure air rowers. The quiet operation packs in 16 levels of electronic resistance, one of the main perks of supplementing air with magnets. Tradeoffs for this machine include the small, hard-to-read monitor which can be a hassle mid-workout. Some users also suggest that high resistance levels can slip mid-workout, decreasing the difficulty unexpectedly. Proper rowing technique is important for staying safe and making efficient strokes. Study the four stages of a proper row (catch, drive, finish, and recovery) to stay on top of your form from beginning to end. Keep your back as straight as possible during your workout to prevent strain and injury. If weight loss is your primary goal, look for a model with a damper to reduce the rowing machine’s air resistance or focus on slower strokes. For muscle conditioning, use the damper to increase air resistance or focus on faster strokes. Q: How do I master the proper rowing technique? A: Practice, practice, practice. The basic rowing motion is pretty simple and easy to pick up. However, stay on top of the nuances of proper technique with consistent practice to stay safe and efficient. Q: Can I use a rowing machine as my main form of exercise? A: Variety is always a great thing for overall health, but rowing is a fantastic core exercise for your routine. This is because of the wide range of muscles rowing works along with the cardiovascular benefits. There are few exercises as wide-reaching and efficient as rowing. Home air row machines are a great way to incorporate this exercise into your life. Q: How long does it take to start burning fat? A: This depends on your experience level and how frequent and intense your workouts are. Frequent, fast-paced workouts will burn fat faster than easier, intermittent workouts. Q: How often should I exercise on my rower? A: Rowing can be a big or small part of your workout routine, depending on your preference. You should get enough cardio exercise for about 150 to 300 minutes per week. Air rowers can find a place in any fitness enthusiast’s workout setup. They provide great value and a wealth of health benefits. Overall, the Marcy Turbine is the best buy all around. At a lower price point, the Stamina ATS is a solid choice as well. Our honorable mentions are great alternatives if you need specific features or want to explore other models. Ever use an air rower machine at home? Agree with our picks? Let us know in the comments below!